Shopping for a new Toyota RAV4? The 2019 Toyota RAV4 Adventure and Limited have a more sophisticated all-wheel-drive system that unfortunately also uses more gasoline. The base engine’s 203 horsepower provides good around-town power matched by more underhood growl than in some rivals. While costlier than the base RAV4, the hybrid makes good use of its powertrain for better acceleration and highway passing. The 8-speed automatic transmission in the base RAV4 sorts through the gears quickly but lacks paddle shifters for descending grades. RAV4 Hybrids use an electronic continuously variable transmission (CVT) that’s prone to surging. With running ground clearance of up to 8.6 inches, the RAV4 has some off-road chops to match its chunky, 4Runner-lite looks. 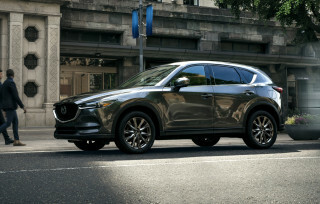 All-wheel-drive models have a trail mode for their traction control system, while the Adventure trim level has additional, terrain-specific modes. The RAV4 does not have a two-speed transfer case with a low range like traditional SUVs, even if it now kind of looks like one. Additionally, the all-wheel-drive system mandatory on Adventure and optional on non-hybrid Limited RAV4s is a sophisticated setup that features brake-based torque-vectoring for better on-road handling and improved dirt road tenacity. The simpler system on RAV4 LE and XLE models is suitable for lousy weather but not as oriented toward spirited driving. 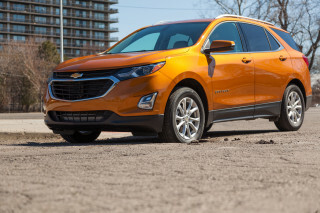 A downside to the torque-vectoring all-wheel-drive system is its toll on fuel economy. RAV4s with the simpler all-wheel-drive setup are rated at 29 mpg combined, while Adventure and Limited trims with all-wheel drive are rated at 27 mpg. Hybrids are estimated by Toyota at up to 40 mpg. The RAV4’s rakish looks dictate some surprising compromises inside. Its roofline is low, and while that doesn’t hinder forward or side vision, it makes climbing into the front and rear seats a challenge for taller passengers. The front seats are comfortable and a power driver’s seat is widely available. The passenger’s seat doesn’t adjust for height in any trim, an odd oversight in a vehicle that can cost around $40,000 with every option. The passenger’s seat sits high, which cuts into head room considerably with either the conventional power moonroof or the much larger panoramic moonroof. Rear-seat riders will find a bench that sits low to the ground to allow for more head room and doors that don’t open as wide as in some rivals. The RAV4’s interior space deficit relative to its competitors shows doesn’t carry over to its cargo area. At around 37 cubic feet with the rear seats upright, it has plenty of space for gear and a power liftgate is included on most trim levels. 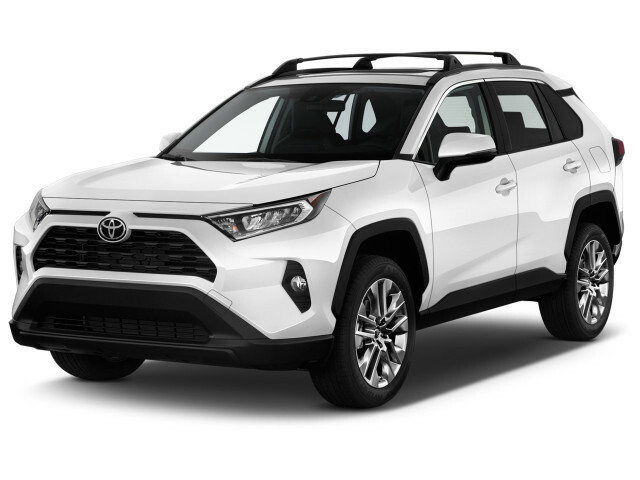 If style is at the top of your priority list for a new crossover SUV, the 2019 Toyota RAV4 gets the mini-off-roader look right. RAV4 Adventure trims have a fake skid plate up front and can be ordered with a contrasting white roof that looks great to our eyes. Hybrid RAV4s have subtly different front-end styling and the hybrid-exclusive XSE trim swaps in shiny black trim in place of unpainted plastic on many surfaces. Admittedly, base RAV4 LEs have a downmarket look with their steel wheels covered by hubcaps. Other RAV4s do the look justice with attractive 17- and 19-inch alloy wheels. Inside, the RAV4 continues its angular look. Its dash has a wide feel punctuated by a tablet-like touchscreen for infotainment that hovers above the climate vents. A wide pocket for smaller items such as smartphones, pens, or gum packs toward the passenger side of the dashboard adds some visual interest and relieves what would otherwise be a wide expanse of plastic. The RAV4’s center console is bulky and sits higher for a more car-like feel than some crossover SUVs. Toyota did a nice job differentiating trim levels with unique upholstery patterns matched to stitching and plastic trim inside. 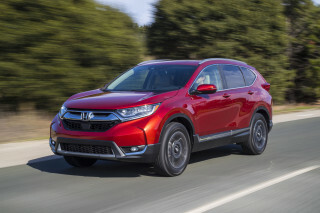 For instance, the RAV4 Adventure’s orange trim echoes what outdoor enthusiasts might find on the latest jackets at REI, while the shiny black in the RAV4 Hybrid XSE has a more urbane feel. Both engine choices in the 2019 Toyota RAV4 furnish good acceleration at the expense of refinement. We wish that Toyota had gone a little further with sound insulation to quell underhood rumble and road noise. Toyota figures about a quarter of RAV4s will have hybrid power, so most on dealer lots use a 2.5-liter inline-4 engine rated at a healthy 203 hp and 184 pound-feet of torque. Front-wheel drive is standard and all-wheel-drive versions have one of two systems to send power to each corner. Regardless of where power goes, it’s sent to the wheels via an 8-speed automatic transmission. The base engine has plenty of scoot from a stop and works well with the automatic transmission. Passing power on the highway is good for a compact crossover SUV, giving the RAV4 a more responsive feel at speed than in some competitors. Unfortunately, the RAV4’s biggest demerit is its lack of refinement—the engine makes its presence known in the cabin, especially under hard acceleration. Many Sun Belt RAV4s will have front-wheel drive. For those in wintry climates or who will venture down a dirt road, Toyota offers two all-wheel-drive systems on the standard RAV4. LE and XLE trims have a conventional system that unobtrusively does its best to send power from side to side and front to rear. RAV4 Adventure and Limited trims swap in a trick setup with brake-based torque vectoring that more rapidly sends power to the wheels with the most traction. While the system dents fuel economy slightly, to the tune of 2 mpg combined, it’s impressive on a slippery road. The more advanced all-wheel-drive system also helps the RAV4 feel more confident on a curvy road. Even the front-wheel-drive RAV4 has well-weighted steering and an agile feel, however. 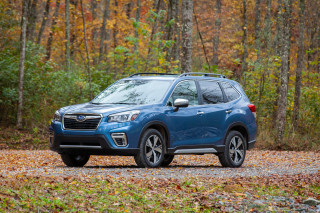 The RAV4’s stiff structure and softer suspension tuning help it absorb bumps well, although it trails the Subaru Forester and Honda CR-V in the way it reacts to harsh impacts. Those crossover SUVs take in stride sharper heaves that upset the RAV4 in our initial testing. RAV4 Adventure trims have two additional traction control modes for off-road use but aren’t significantly more capable when the road crumbles away than the rest of the lineup. RAV4 Hybrids have more power—219 hp—thanks to an electric motor paired to a nickel metal-hydride battery pack squeezed under the rear seat. Under light acceleration, the RAV4 Hybrid can move up to about 40 mph on electric power alone before the gas engine kicks on with a gentle rumble to help out. The RAV4 Hybrid’s electronic CVT works well to keep engine revs low, although passing acceleration induces an in-cabin growl like in the non-hybrid model. All Hybrids are all-wheel drive thanks to a separate electric motor that shuttles power between the rear wheels. In a brief drive on an off-road course, we found that the RAV4 Hybrid scuttled up a loose sand hill with ease, but struggled when one wheel was off the ground. Its all-wheel-drive system isn’t as effective at transferring power between the wheels as the setup in the RAV4 Adventure and Limited trims. In LE and Limited guise, the RAV4 Hybrid’s ride and handling match that of the standard model. The RAV4 Hybrid XSE has a slightly stiffer suspension that didn’t seem to be uncomfortably taut during our initial preview drives. The 2019 Toyota RAV4 puts form above function. For many drivers, that’ll be just fine—but for taller folks, some of its competitors may be better choices. What hurts the RAV4 inside is what makes it look so good from the outside: its low roofline. Toyota lowered the RAV4’s roofline about an inch compared to last year’s model, and it makes entry and exit a challenge for taller riders. The lack of height adjustment for a passenger seat that sits about an inch too high for most riders compounds matters. It’ll take even average-height passengers some time to get used to the sloping windshield pillars that stand ready to bonk a forehead. The front seats themselves are comfortable, with good support and available synthetic leather upholstery that feels like the real thing and will probably hold up better. The high-riding passenger’s seat meant that even a 5’11” tester nearly brushed the headliner with the available moonroof. The RAV4’s rear doors don’t open as wide as some rivals, which may combine with the low roof to make loading a child seat a challenge. The rear bench is light on contouring and sits low to the ground, which doesn’t help leg room but means there’s more head room than in the front seat. At the rear, the RAV4 has about 37 cubic feet of cargo space with the rear seats upright and about 69 cubes with them folded flat. Higher-trim RAV4s have doors draped in soft synthetic leather upholstery with contrasting stitching, but the hard plastic door panels on RAV4 LE and XLE trims doesn’t impress. We like the color-coordinated panels, stitching, and upholstery on hybrid and Adventure trims, though. We’re encouraged by the wide level of crash-avoidance tech that Toyota fits to every 2019 RAV4, however. Automatic emergency braking with pedestrian detection, adaptive cruise control, and active lane control are standard. Blind-spot monitors are optional on the base RAV4 LE and are standard on other trim levels. The RAV4 comes with eight airbags, stability control, and anti-lock brakes. A digital rearview mirror fed by a camera mounted to the tailgate is optional on higher trim levels. Its picture is clear, but the screen built into the rearview mirror is a lot smaller than the glass mirror. The 2019 Toyota RAV4 is a decent value in most of its numerous trim levels. The RAV4 lineup starts with the LE trim available for both standard and RAV4 Hybrid powertrains. The LE hits most of the basics: active safety gear, a 7.0-inch touchscreen for infotainment with Apple CarPlay, Bluetooth, a single USB port, power features, cloth upholstery, and a 4.2-inch TFT screen between its gauges for trim computer functions. At around $26,500, the base RAV4 is pricier than some rivals but hardly spartan. The RAV4 Hybrid LE costs $800 more. From there, base and hybrid powertrains diverge. The standard engine is offered in XLE, Adventure, and Limited trim levels, while the RAV4 Hybrid can be ordered in XSE and Limited trims. The XLE trim adds some niceties such as 17-inch alloy wheels in place of 16-inch steel wheels with hubcaps, a power moonroof, blind-spot monitors, dual-zone automatic climate control, keyless ignition, and four additional USB ports. The XLE Premium adds 19-inch alloy wheels, synthetic leather upholstery, a power tailgate, and an 8-way power driver’s seat. It’s the RAV4 we’d recommend for most buyers. RAV4 Hybrid XSE trims are equipped about like the XLE Premium but with 18-inch wheels and a sport-tuned suspension. The RAV4 Adventure is a compelling choice for its butch styling. It builds on the XLE Premium with mostly cosmetic upgrades, although heated and cooled front seats are optional. Notably, the RAV4 Adventure is only available with all-wheel drive. Other non-hybrid trim levels can be ordered with front- or all-wheel drive. Topping the lineup, the Limited trim adds to the XLE Premium and Hybrid XSE driver’s seat memory, an 8.0-inch touchscreen with navigation, and a rearview mirror that doubles as a screen for a camera mounted to the tailgate for unobstructed rearward vision. The RAV4 Limited offers the widest range of options in the lineup, with heated and cooled front seats, a hands-free power liftgate, and JBL audio as extras. All in, a RAV4 Hybrid Limited can cost nearly $40,000. We think the RAV4 makes the most sense in XLE Premium trim for most shoppers, although the allure of the Adventure grade’s orange interior may sway us. No matter the trim level, the 2019 Toyota RAV4 sips fuel at a lower rate than most of its competitors. However, not all RAV4s are equal. Let’s start with the thirstiest RAV4s, the Adventure and Limited trims with all-wheel drive. Those are rated at 24 mpg city, 32 highway, 27 combined. 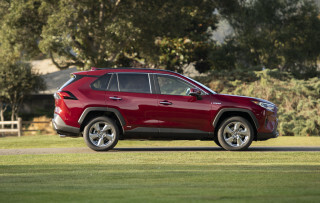 Stick with all-wheel drive and the RAV4 LE and XLE are rated at 26/33/29 mpg. Front-wheel-drive RAV4 LE and Limiteds are rated at 26/34/29 mpg. The RAV4 XLE with front-wheel drive does a smidge better in the city, at least on paper. It’s rated at 27/34/29 mpg. The RAV4 Hybrid comes only with all-wheel drive and is estimated by Toyota to be rated at 41/38/40 mpg. Non-hybrid competitors generally hover in the 27 to 29 mpg range, so the RAV4 is competitive and in some cases the most efficient of its rivals. 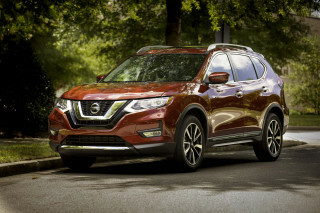 The RAV4 Hybrid easily bests the 33 to 34 mpg of its closest competitor, the Nissan Rogue Hybrid. Jeep is not a role model! SQUARE fenders? Never thought Toyota would try and copy Jeep :( Fog lights almost as high as headlights? Strange. The good thing I guess is that you just raised the resale value of my 2017 Rav4 lol. SQUARE fenders? Never thought Toyota would try and copy Jeep :( Fog lights almost as high as headlights? Strange.